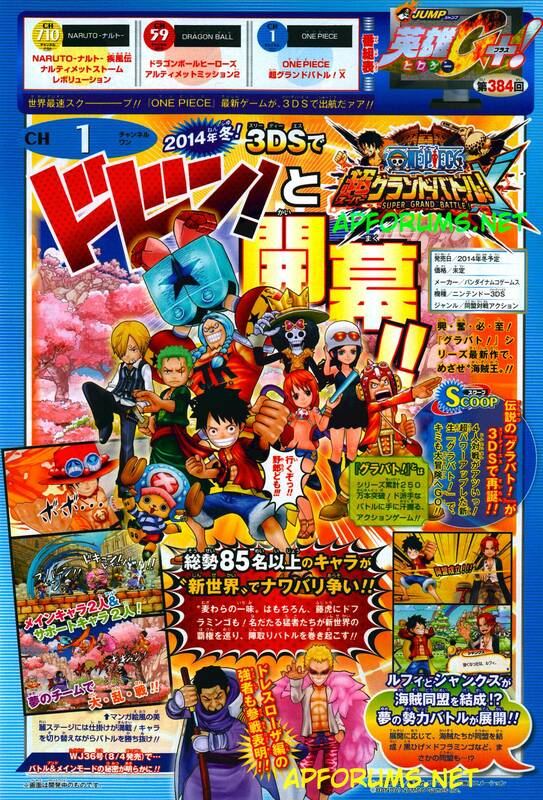 Another One Piece game is in the works for the 3DS and this one seems to be a fighting game. We will have this translated later tonight to give you the details of the scan. Will this be for Japan only? Or will North America, Europe Etc. be getting this as well? Japan first and then I’m sure 6 months to a year later we will get it localized. In a bit. Probably 1-2 hours from now but no promises. Graphics seem dissapointing like they could’ve been done on a ds, not a big op fan but i feel bad that they never really get a games that do what cc2 does for naruto (the ps3 games just aren’t up to par although uwr looks better than previous games), I would support a good op fighting game for consoles. It’s a 3DS game these graphics are expected and they actually look pretty good for a 3DS game. You can’t compare this to CC2’s Naruto Storm series because that’s completely unfair. That’s like comparing a PSP to PS3 game. Not really fair to do. Its not even that. This game is retaining the art style the grand battle series has had since GB 3 (JP) or in the US Grand battle. I must say however the chibi style is seems to be more emphasized in this title than Grand battle rush or Grand adventure but I like it. I loved Gigant and Grand battle so I have very high hopes for this game. It is unfair, but by the comment I meant they have had no game that has fully embodied the op experience like naruto gets from cc2 and that I wouldn’t mind supporting one that did. As for the graphics they just don’t look as clean as some other 3ds games, I like more the art style of that rock lee game for 3ds (sorry for all the naruto references) but this style is still good and may fit op better. The art style is supposed to loosely represent the Grand Battle series while slightly being a bit more mature. I dig the art style for a portable game like this. I think One Piece World Red represented One Piece very well as far as art style (even looks stunning on the 3DS) so I would have to disagree there at least. Yes, graphically i’d say all the ps3 op games have shined and uwr looks the best in both gameplay and graphics, I’ve just never been wowed by the op games ya know? But that may be because I’m not the biggest op fan. OMFGGG SOO MUCH YES! I’ve been waiting for grand battle to return for years and based on this scan it seems like it’s 4 players! DAMN!! RELEASE IT ALSO ON PS3 ! !